Things are starting to wind down. I have only two classes left in the Beginning Farmer’s Program, which was a year long. I am sad to see this ending. It was such an amazing experience and I recommend it to anyone who is interested. I have learned unbelievable amounts of information and have also met the most wonderful people with the same interest as myself. We had another great harvest this weekend but it is noticeable that we are not getting the weight we were getting two weeks ago. 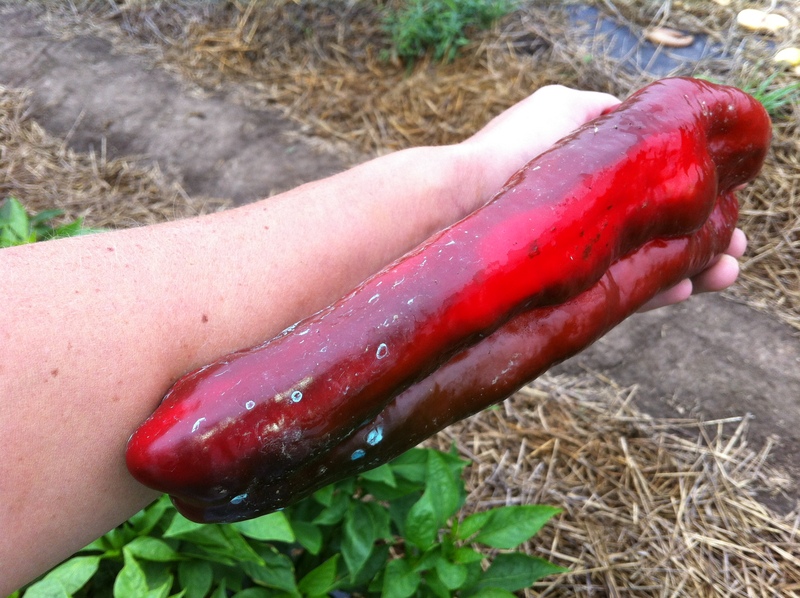 The weather has turned cooler and with that things are slower to produce. Our tomatoes have about another two weeks, which is fine by me. (I never thought I would say this but I am a little tomatoed out.) We lasted as long as other local growers in the area, still getting a nice harvest and product. 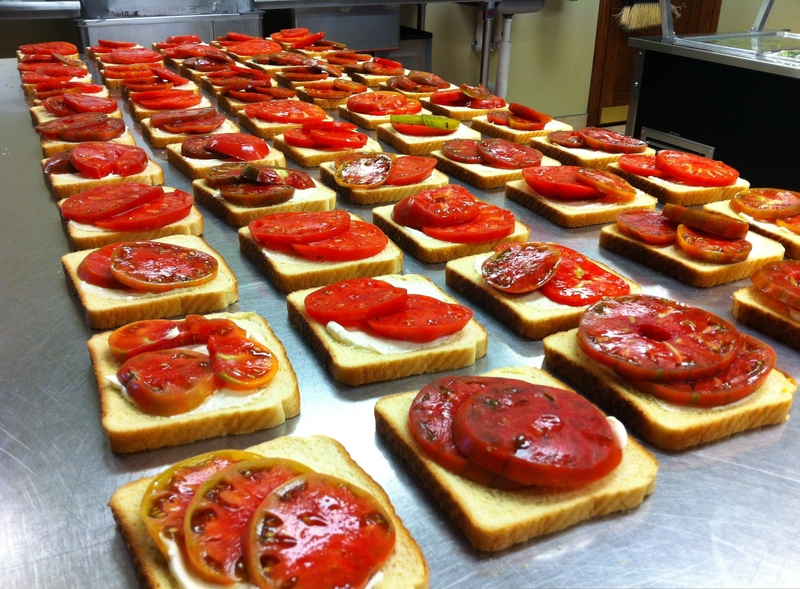 I was even able to test my boy’s true appreciation for them with the ultimate tomato sandwich. NO MEAT! They totally passed :). 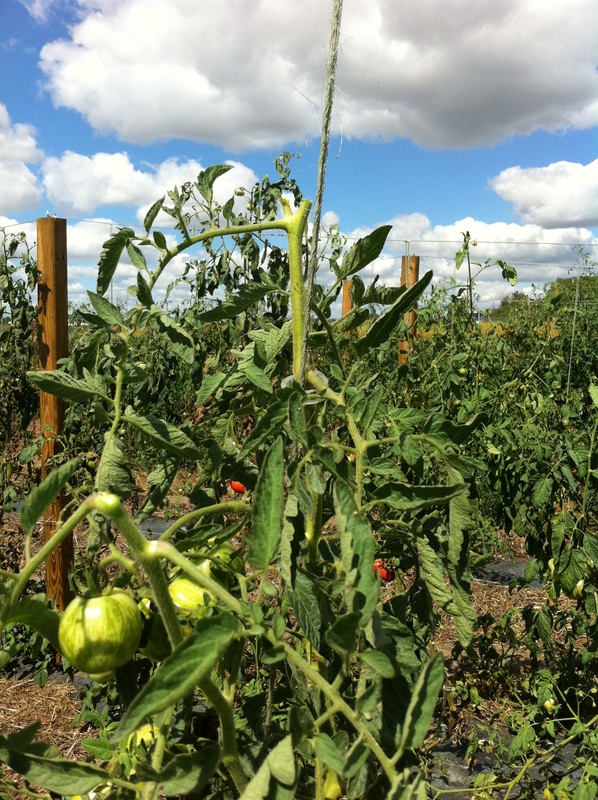 This ending of the tomatoes will also allow more time for us to focus on our other crops. We had our first harvest of green beans for the fall on Friday. For all you growers out there who have planted green beans you will know that they are a long tedious harvest, BUT they were beautiful and I can’t wait to serve them. Last week’s plan for the salad greens was set in motion and worked pretty well. We had a nice harvest yesterday and then I was out there bright and early again this morning harvesting more. 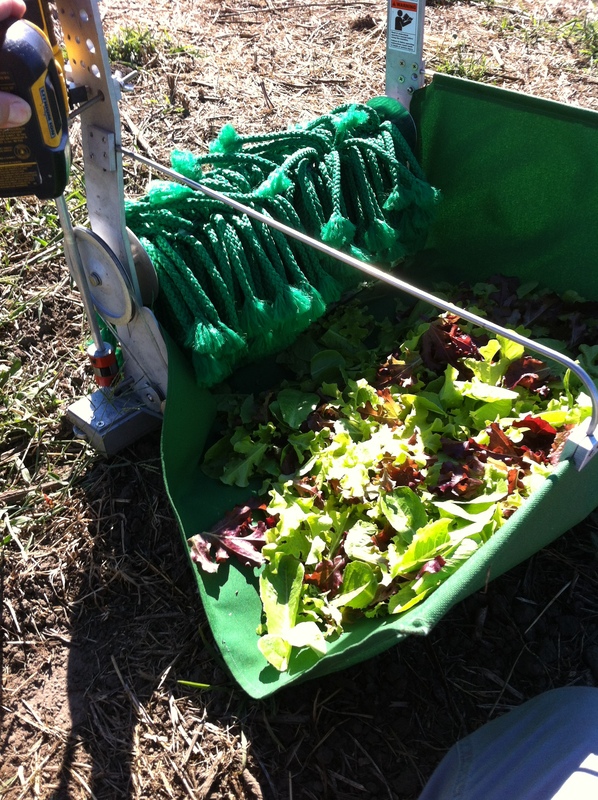 It is amazing how inventions (such as the student farm’s greens harvester) can make life so much easier. This little tool cut my harvesting time in 1/2. I am so fortunate to use it and it is very neat seeing it work. The motor is a power drill which gives power to two saw blades. That is what does the cutting. Then it has a rope wheel that turns and pulls the cut greens into a basket. I WANT ONE!! 🙂 More farm land first…. more farm land first. I have really enjoyed using the product I have grown. I have not ordered tomatoes, lettuce and peppers in over three weeks. 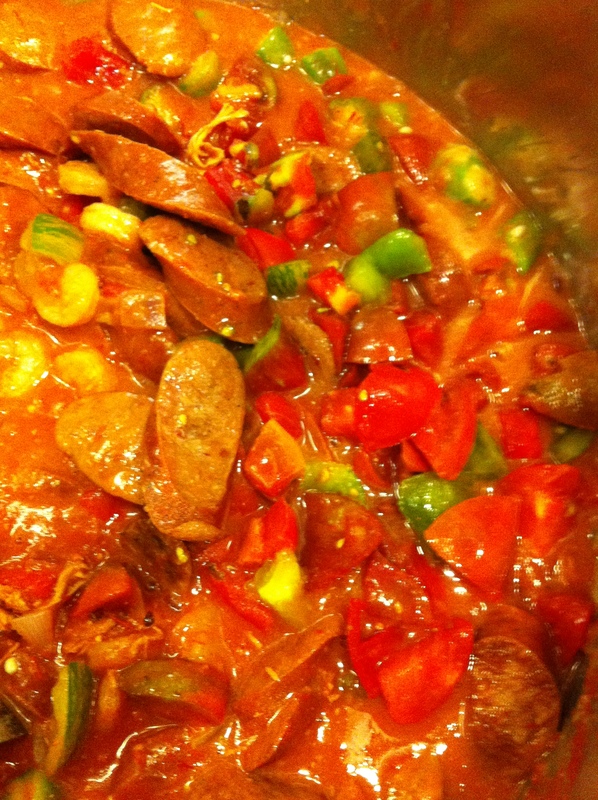 It is so much fun to have a kitchen to play around in and an audience who appreciates it. I had two boys ask me today when they could come back to the farm! My answer…. Wednesday at 5am (j/k, but not really) :). While harvesting the salad greens we quickly discovered that our salad spinner, which only holds 1.5# of salad at a time, was not convenient for our time restraint of getting 65# of lettuce harvested, washed, dried and shipped out by 10 am. I am not sure we could have started any earlier, considering we were using the headlights of my car to see the bed at 5 that morning. As I was licking the wounds of the blisters on my knuckles from holding the salad spinner, I thought there has to be a better way to do this, considering we have six more weeks of salad green harvest for the season. Kevin and I have regrouped, healed our wounds from that day and have a new plan to set in motion. We have since received a new salad spinner, so there will be two of us drying at a time. I have also added another harvest day to my week to cut down the amount of greens we will have to process in one morning. 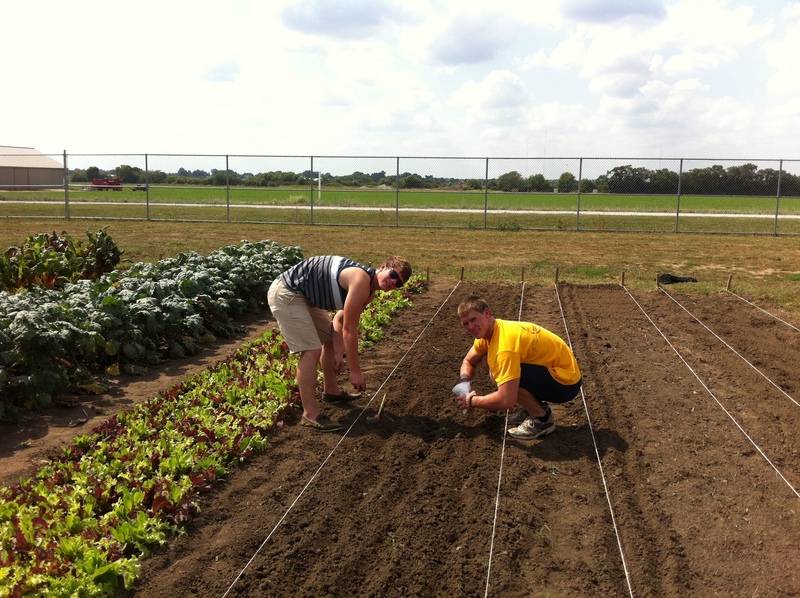 I have sought the help of the head of the U of I student farm (Zack Grant) and we have a schedule to use their salad greens harvester, which should shave off an hour of our time. All we can do is learn from our mistakes and try to make it more efficient in the future. I can’t emphasize enough what an amazing learning experience this has been and what amazing training for the future when we acquire more land. The weather is turning cooler and I am nervous about the first frost date, which is quickly approaching according to the Farmer’s Almanac. I cut the tops of my tomatoes on Friday afternoon which will cause them to ripen faster, ceasing new growth to develop on the top of the single leader. Kevin and I had another great harvest on Sunday, getting almost 350 lbs of tomatoes and peppers. I am excited that we will have green beans in about a week and the spinach seedlings are already starting to come up and look forward to that as well. Occasionally I find myself missing the restaurant life and the friends/ family I have made along the way. One of the perks of working in great restaurants is that you get to eat the most amazing food. I would go into a restaurant with the intent of ordering an appetizer or two (probably because that was all I could afford) and leaving having had the entire tasting menu and then some. I have had the pleasure of eating the finest foods prepared by some of the best chefs in the country, my friends/ brothers and sisters in the industry. This farming experience is very similar to what I just described but instead of chefs they are growers. I have met some of the most amazing people this summer and what I hope to call lifelong friends. They have not only provided me with knowledge and physical help, but have also shared the fruits of their labor. I have had bushels upon bushels of some of the best sweet corn I have ever tasted. Kevin and I have been given salsa, pickles and more peaches than you could imagine. 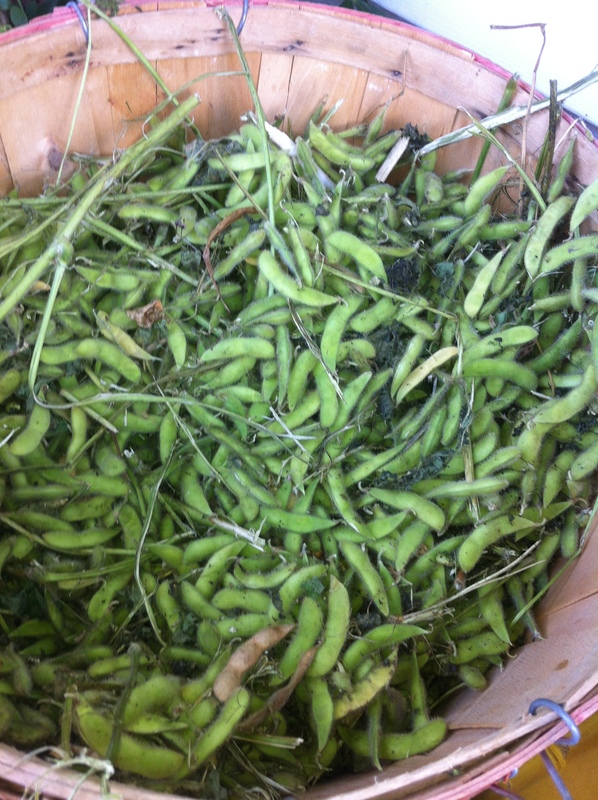 I was just given 20 lbs of fresh edamame on Friday. I am truly fortunate to have met the people I have. Thank you Jeremy Shafer and Bryan Warsaw! You guys are two of my most favorite farmers and I appreciate everything you do for me! In other news, Kevin and I once again had a huge harvest this weekend. We got another 200 lbs of tomatoes and peppers. We also harvested the last of our kale that had not been damaged by disease and insects. I started the kale in the greenhouse back in March so we had a nice long season and a great harvest from it throughout the summer. I am very excited to announce that our baby lettuce mix will have its first harvest on Wednesday. We will be doing our first cutting off of our first bed and thus starts the 6 weeks of using our own grown spring mix. I am super pumped about this considering I have already ordered and served close to 80# of salad mix since the start of the semester. It will be nice to say that it is our own. Happy Labor Day to all you hard workers out there!! It was nice to have a three day weekend to catch up at our little farm. 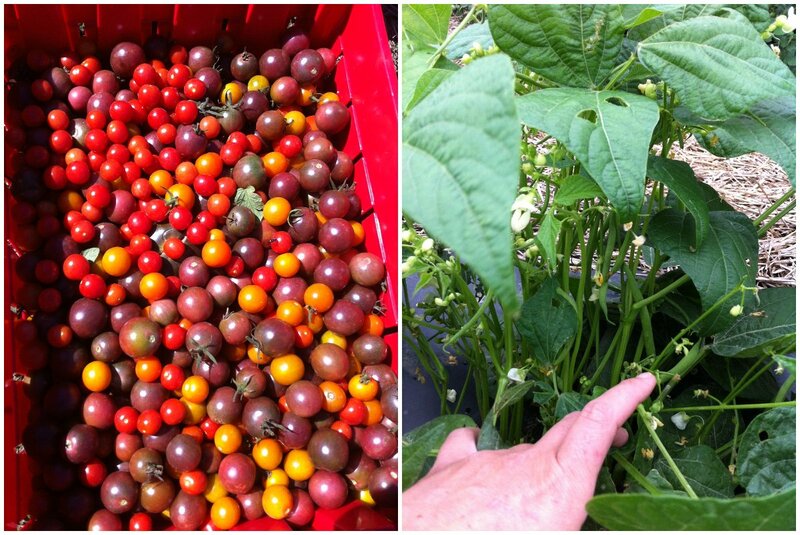 We had a huge harvest of peppers and tomatoes this weekend in preparation for the week. We had close to 140# of peppers ready and 250# of tomatoes. 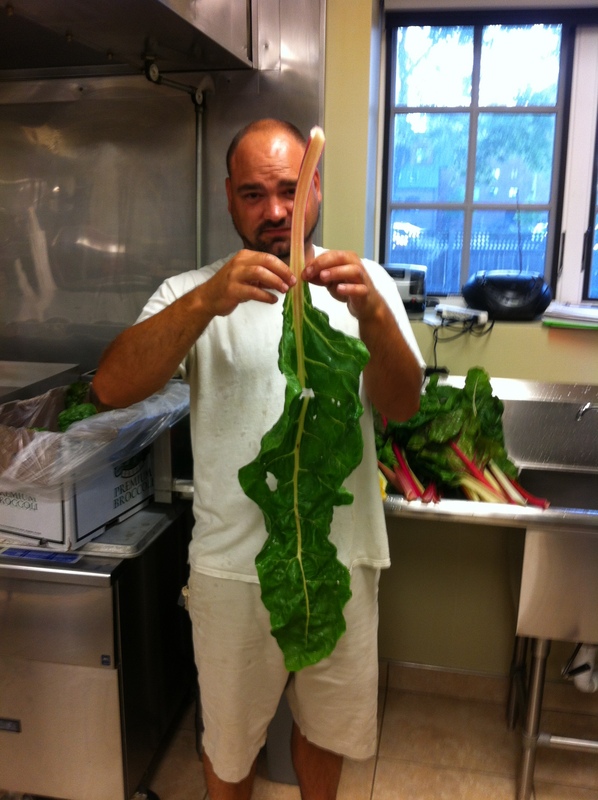 We will also be harvesting 40# of chard on Wednesday. Everything is colorful and HUGE!! We are continuing to fight the bacteria and pest battle unfortunately. The latest to be hit is the kale, which is very sad because we just introduced it (with great success) to the students. Luckily we will probably have one more successful harvest before the end of its life. We are also having a very serious aphid problem with our tomatoes. Because we are using organic practices, the only treatment is a very expensive concentrate of pyganic insecticide. I have consulted with a few professional growers and they seem to think that we might be ok for now since it is so late in the growing season. Unfortunately we have already started to see signs of damage on the fruit, which is heartbreaking. I also must mention that I love digging in the dirt as much as the next “tom boy” but being sticky and covered in little itchy spiders is a little gross after a while. It seems as though we have conquered so many battles this season and come out on the other side slightly unscathed only to be confronted with another damaging problem. The new growth still looks good so I remain hopeful that we can have another great three weeks of harvest. Our fall plantings are green and thriving! By the end of next week we will have green beans and baby salad mix to add to our produce list. We planted two beds of green beans (knowing they are a popular item with the students). One bed is a week behind the other bed so we should be able to harvest 40# a week for a consistent four week period. We have two beds dedicated to spinach, which have already been planted. Unfortunately that pesky mother nature hit us with a very warm week last week and the week before. Our little seedlings were fried and now both beds have to be replanted. I am not too upset about this as long as our frost date isn’t early this year. With this crazy weather, who knows??? 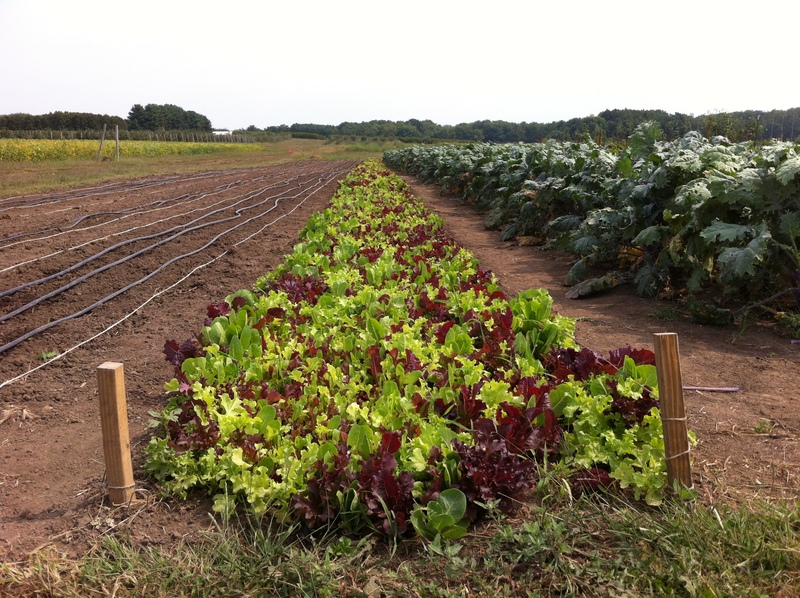 Our salad greens are booming and we should have our first 90#s ready by next week. We have three beds dedicated to this wonderful crop and are planning to have at least two cuttings off each bed. These beds are two weeks behind the other, which means ……. 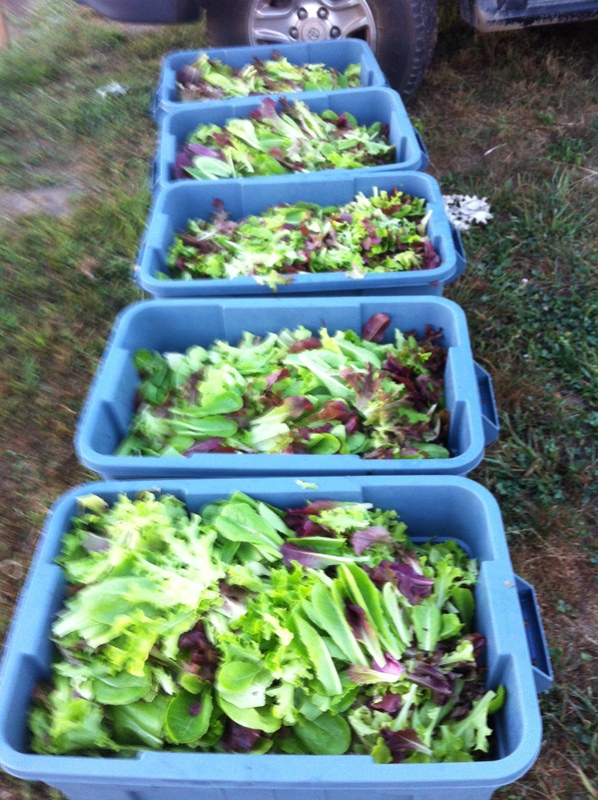 we will have 90# of baby salad greens to offer our clients for up to a six week period!! The demand for the produce we are bringing in is simply amazing. We are delivering Mondays and Wednesdays and everything has a home by ten in the morning on each of these days. I am so excited and continue to be impressed with the palates of these students. I have had a lot of fun playing in the kitchen with the produce I have grown and it simply makes my day to introduce (in some instances) and cook in a true “farm to table” fashion.